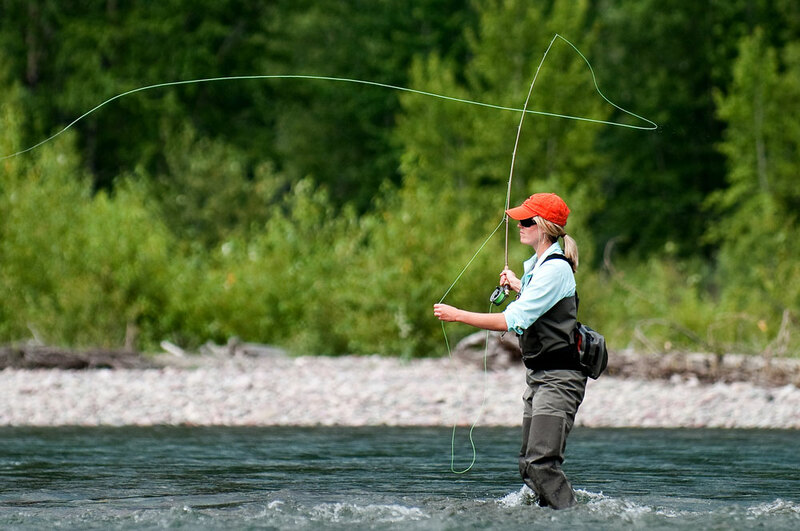 With countless ways to recreate, from golf to yoga and biking to fly-fishing, Western Montana sets the scene for an epic girls getaway—without breaking the bank. Our awe-inspiring views create the perfect backdrop to relax, reconnect and rejuvenate with friends. Set aside time to explore one of our vibrant (and quite charming) downtowns where you will be greeted with warm western hospitality. Here’s your guide to an authentic small-town adventure and instagram-worthy retreats in Glacier Country. Just outside Glacier National Park, Dancing Spirit Ranch provides year-round yoga retreats. Reach peaceful serenity by practicing yoga outside in the unmatched scenery of the Flathead Valley. The Ladies Summer Camp, May 30 – June 2, 2019, combines invigorating and restorative yoga with meditation, leaving you in a blissful state. The camp is rounded out with daily activities like stand-up paddleboarding and hikes in Glacier National Park, plus nightly campfires. Explore Glacier Country on two wheels. You would be hard-pressed to find a more authentic Glacier Country adventure than Whitefish Bike Retreat. This unique destination located outside of Whitefish calls to you and your bike-loving friends. The resort has a single-lap trail around the property and a skills area with jumps and obstacles for all levels of rider, and also offers accommodations so you can sleep-wake-ride. The property leads to The Whitefish Trail network, which encompasses 42+ miles of trails with loops, scenic overlooks, logging roads and natural-surface trails to ride. 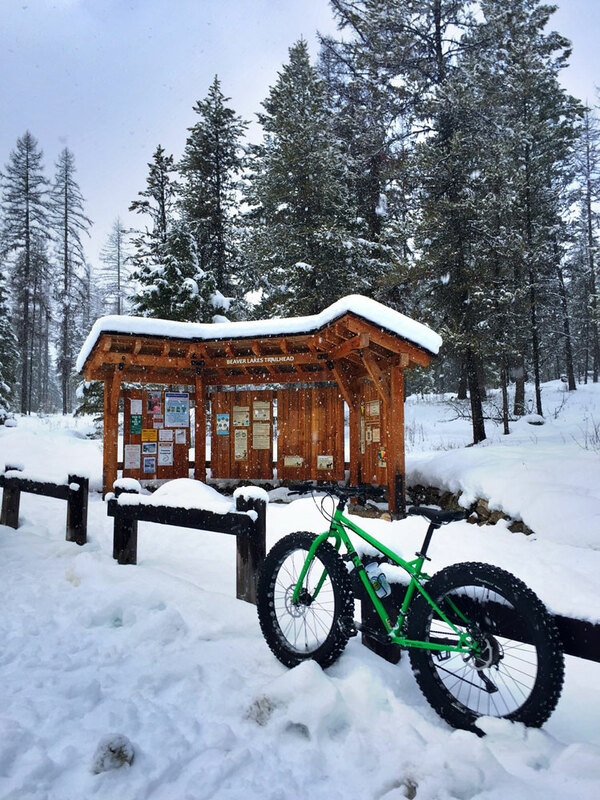 In the winter, try fat biking—an increasingly popular and wildly fun activity. The oversized tires on fat bikes make it easy to move across the snow. Rentals are available on-site at Whitefish Bike Retreat. 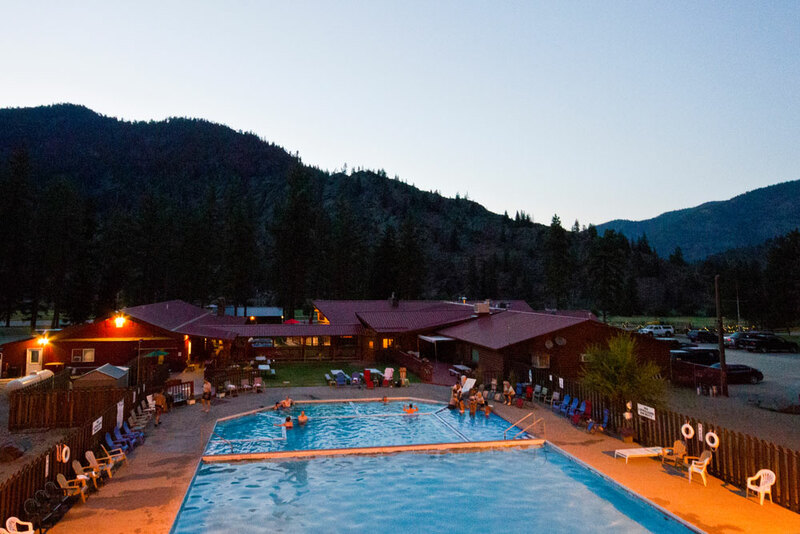 Soak in natural mineral waters at Quinn’s Hot Springs Resort. One of our favorite ways to unwind is to soak in the warm mineral waters at Quinn’s Hot Springs Resort located outside of Paradise. If you are searching for a low-key girls weekend, look no further. Mineral pools have long been thought to offer health benefits, and the pools at Quinn’s are 100 percent natural. Temperatures range from a steamy 106 degrees to a cool and mellow 89 degrees. Overlooking the Clark Fork River, it’s the perfect place to relax and stay awhile, with two lodges, 25 beautiful log cabins, a restaurant and a tavern all on location. Plan to stay during their High Country Cowboys Dinner Show March 18, 2019 or May 6, 2019, to enjoy live western music and fine dining after a rejuvenating soak. 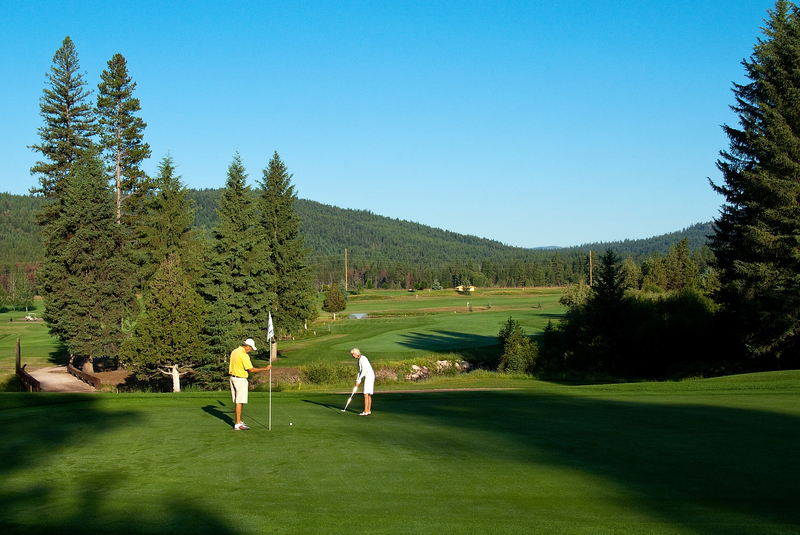 Head to Double Arrow Resort for a round (or many) of golf, and you won’t be disappointed. In Western Montana springtime means swing time. 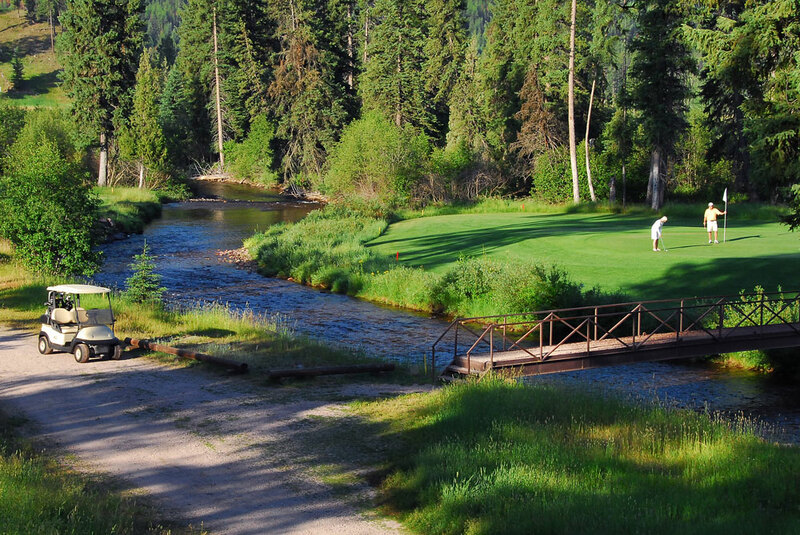 Challenge your friends on the golf course at Double Arrow Resort, near Seeley Lake. It’s a true golfer’s paradise with breathtaking views of the Swan and Mission mountain ranges, and you’re bound to catch a glimpse of some wildlife on the sidelines. The 6,500-yard course is woven through the landscape truly immersing you in its beauty. Each hole of this scenic course is staged with three sets of tees; choose one based on your skill level. Top off the day with a glass of award-winning wine and classic country cuisine at Seasons Restaurant in the historic main lodge, then get cozy in one of the rustic or new spacious cabins and settle in. Don’t miss the Spring Stay & Play Golf Package available through June 8, 2019. 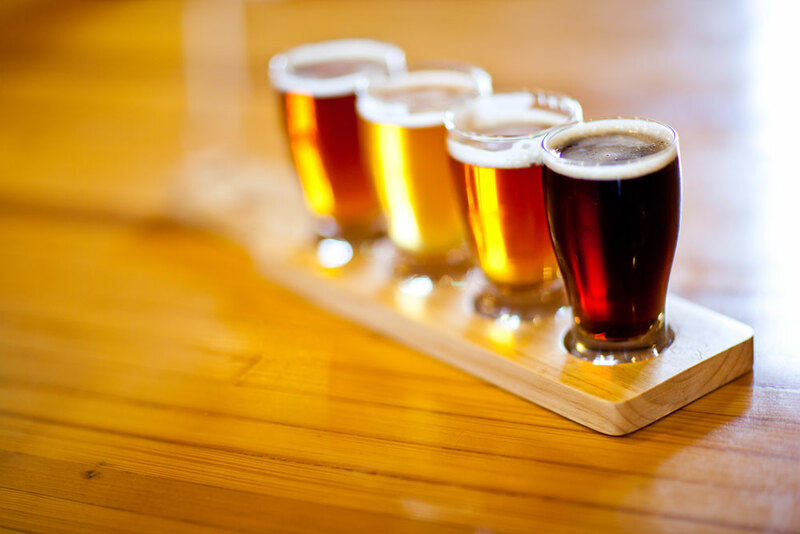 Try all the different brews by ordering a flight. 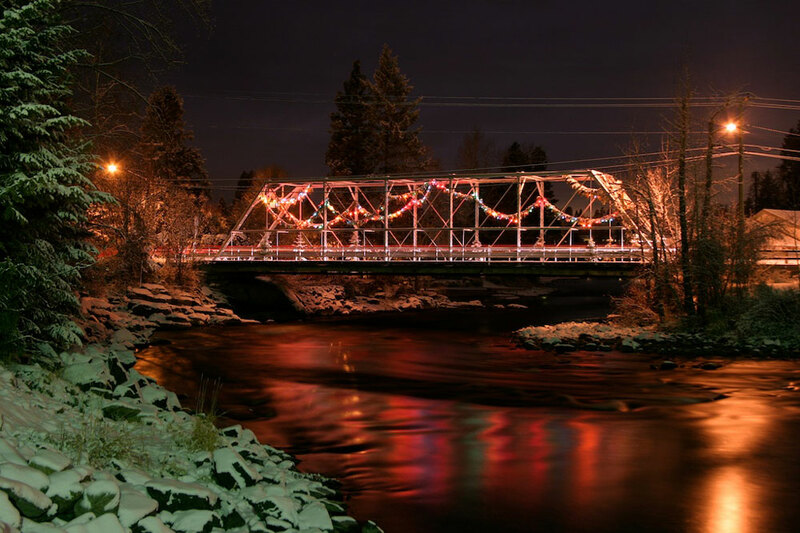 Missoula—the cultural hub of Glacier Country—is one town that bustles year-round. It boasts a fast-growing live music scene, museums, art galleries, plus food options from fine dining to cafés and everything in between. 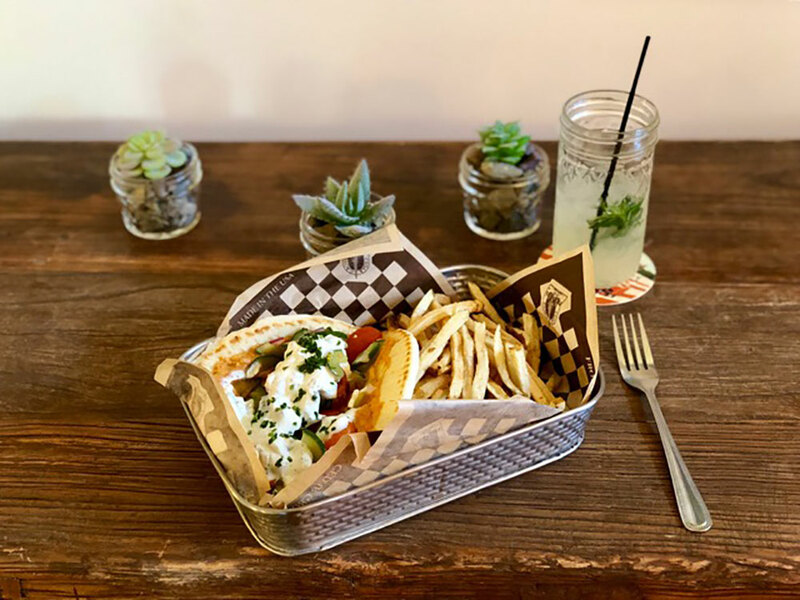 With 11 breweries, three distilleries, two wineries and a cidery, it’s not a stretch to say your squad could spend the whole weekend enjoying the eateries and spirits. Stay at the Gibson Mansion Bed and Breakfast, where Victorian elegance meets modern convenience. For a more central stay, the Holiday Inn Missoula Downtown, in the heart of Missoula, is a short walk from many of the best shops and galleries. Cast a line in Western Montana. Anchoring the Bitterroot Valley is Hamilton, the valley’s largest community. This explore-worthy town offers something for everyone in your group, with theater, live music, local breweries and eclectic downtown shops. For a look at Hamilton’s history, tour the historic Daly Mansion, the 24,000 square foot home of copper baron Marcus Daly. The Bitterroot River, a short drive away, is an angler’s paradise known for phenomenal fishing. The Cabins at Deer Crossing offer a rustic retreat; choose between the Homestead Cabin and the Montana Cabin, or stay at the Big Sky Suite in the main lodge. Steps away from downtown, The Historic Wesley Building can be rented on VRBO. 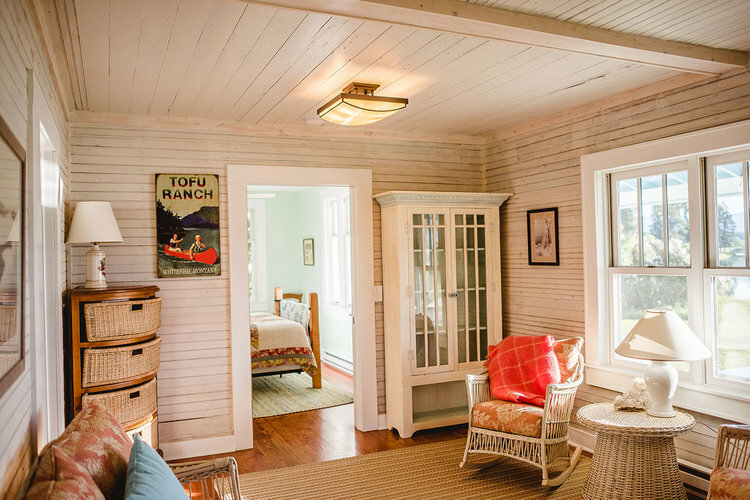 With a wraparound porch and conservatory, this house lays on the charm. With two major international airports—Missoula (MSO) and Glacier Park (FCA)—serviced by Allegiant Air, Alaska Airlines, American Airlines, Delta Airlines, Frontier Airlines and United Airlines, there are plenty of routes to provide smooth travel plans for visiting Western Montana. Direct flights regularly arrive from Dallas-Fort Worth, Denver, Las Vegas, Minneapolis-Saint Paul, Phoenix-Mesa, Portland, Salt Lake City and Seattle-Tacoma. Seasonal flights arrive from Atlanta, Chicago O’Hare, Los Angeles, Oakland and San Francisco. In addition to air travel, you can get here by train on Amtrak’s Empire Builder or drive in on our very scenic highway system. This entry was posted in Art, Arts and Culture, Bitterroot Valley, Columbia Falls, Direct Flights, Fishing, Food, Hamilton, Hot Springs, Missoula, Montana, Montana Fun, Outdoor Fun, Paradise, Seeley Lake, Shopping, Spring, Things To Do, vacation, Whitefish, Winter Fun on February 11, 2019 by GlacierMT. We have plenty of hidden treasures here in Western Montana, and sometimes the best—and only—way to discover them is to go off-road into our beautiful backcountry and heavenly high country. You can cover quite a bit of ground when you get off the main roads and explore our pristine alpine lakes, lush forests and mesmerizing mountain meadows. 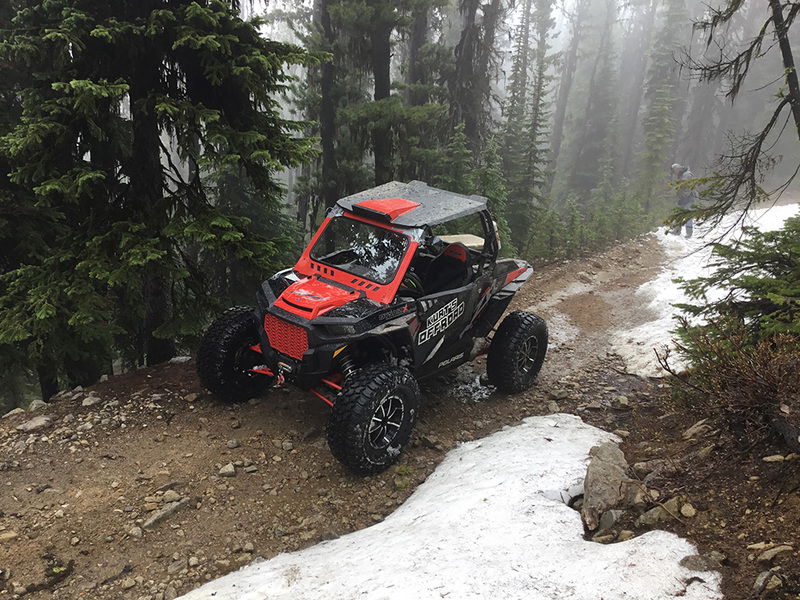 From technical to family-friendly rides, alpine all-terrain vehicle (ATV) adventures abound in Glacier Country. It’s time to revel in the rugged—here’s a handful of our favorite rides. This local’s favorite west of Kalispell is popular in the summertime, but if you’re looking for a quieter ride, venture over in the late spring or early fall before big-game hunting season begins. The trail—just north of Ashley Lake—offers 7 miles of scenic ATV terrain, and the lake itself provides off-trail recreation like swimming, fishing and camping. Pitch a tent on one of three campgrounds and reel in one of the huge rainbow-cutthroat trout hybrids the lake is known for. GETTING THERE: From Kalispell, take U.S. Highway 2 west for 4 miles, turn onto Ashley Lake Road (Forest Service Road #912) for 15 miles, then turn onto Forest Service Road #10236 for about 4 miles. The trailhead is marked with signs. 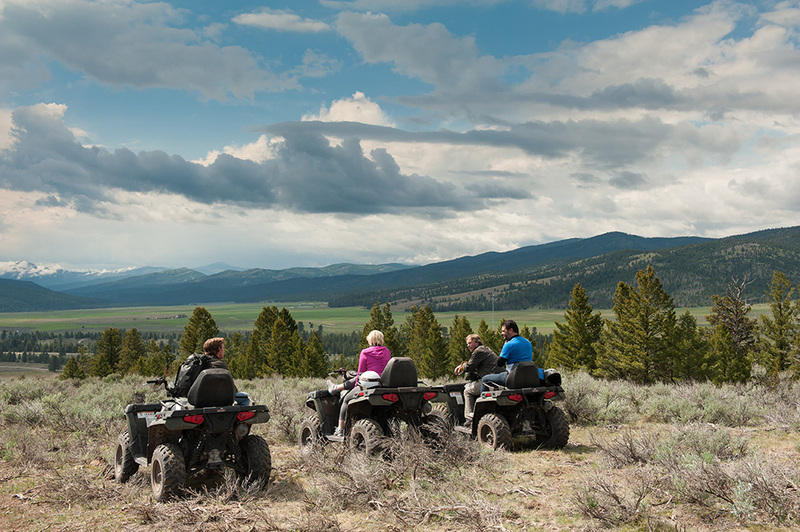 For picture-perfect views of the Missoula Valley as well as the Sapphire and Rattlesnake Mountains, Blue Mountain Recreation Area boasts about 15 miles of motorized vehicle trails, four of which are open to ATVs. There’s a fire lookout tower in service from July – August, and you can climb to the top for stunning views of Lolo Peak, the Selway-Bitterroot Wilderness and the Mission Mountains. Be sure to pick up an off-road sticker (available at the Missoula County Courthouse) before hitting Blue Mountain on your off-highway vehicle (OHV). GETTING THERE: From Missoula, head south on U.S. Highway 93 for about 2 miles, making a right (north) onto Blue Mountain Road for 1.4 miles. Turn left onto Forest Service Road 365 for 1.2 miles, and the staging area will be on your left. Just east of Columbia Falls in Hungry Horse, Montana, this natural terrain track is open to ATVs and packs a punch with steep and challenging elevation gains. You’ll also find camping and other adventures at nearby Hungry Horse Dam. Time your trail trip right and you’ll get to see a race event held by the High Country Motocross Association. GETTING THERE: From Columbia Falls, take U.S. Highway 2 east for about 6 miles. When you see the Forest Service station on your right, turn south onto Colorado Boulevard for about 1.25 miles. Look for a gravel road on the left and turn there. The track is about a half mile down on the right. Sand dunes in Montana? Don’t mind if we do. Mix things up off trail in the dunes and play pits of this large open area at the northeast corner of the Koocanusa Reservoir, best accessed late March through late June when the water levels are low. You’ll also find 20 miles of trails that lead into the woods surrounding the reservoir. Fun Fact: This is the original site of the city of Rexford. 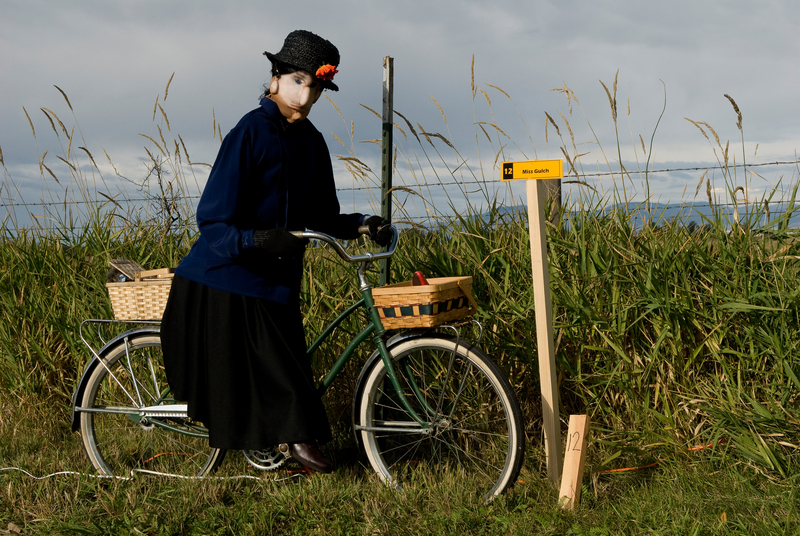 You’ll discover American Indian burial grounds in the area, which are well marked and closed to riding. GETTING THERE: From Eureka, take U.S. Highway 93 north for 5 miles to State Route 37. Take a left on MT-37 for 2.2 miles, then veer right onto Douglas Hill Road for half a mile, turn right onto Sophie Lake Road for 1 mile, veer left onto Iowa Flats Road for .1 miles, and then turn right onto Sophie Lake Road for 3.5 miles toward the lake. South of Darby past Painted Rocks Lake, this “destination ride” offers a scenic 8-mile excursion to Overwhich Falls. This easy ride does have a few steep, rocky sections to be aware of, and encounters with horses, hikers and mountain bikers are possible, but the views—and the falls—are worth it. GETTING THERE: From Darby, head south for 4.3 miles. Turn right onto West Fork Road, heading south past Painted Rocks Lake to Forest Service Road #5703, where you’ll head east for about 2 miles to Forest Road #5706. Turn north and follow this road to the trailhead. There is a good turnaround and parking for vehicles and trailers about 7 miles from the trailhead in NW Section 17, west of Gentile Creek. 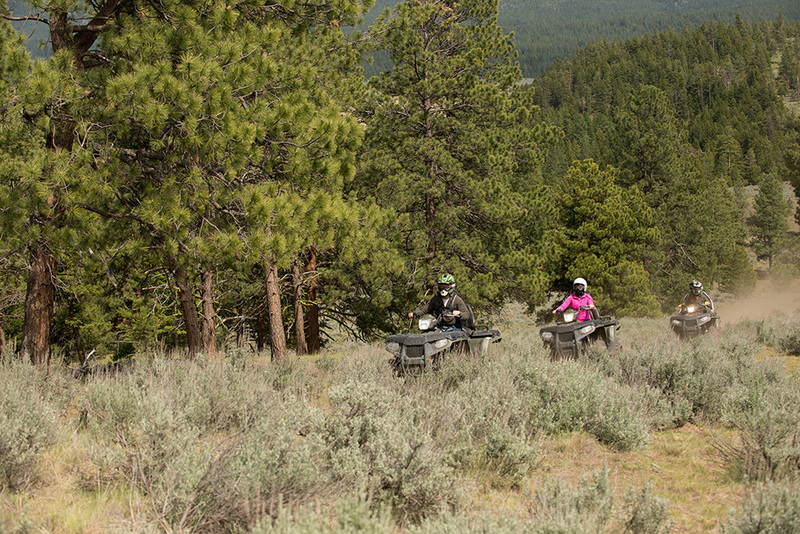 Just last summer, the Bitterroot National Forest opened 50 miles of trails to ATVs, including two loops—#1, a 28-mile loop and #2, a 15-mile loop—on the old Darby Lumber Lands, also south of Darby. This new trail system is popular with beginner and intermediate riders, and, as always, the views are spectacular. GETTING THERE: From Darby, head south on U.S. Highway 93 for about 4 miles and take a left on Rye Creek Road. For Loop #1, take Rye Creek Road for 4 miles to North Fork Rye Creek Road/North Fork Road, where you’ll take a left and drive for about 6 miles until you reach Road #1127 and the trailhead. For Loop #2, take Rye Creek Road for 6 miles. Before the Rock Creek Road divide, you’ll see a parking area on the left with signage for Loop #2. KNOW BEFORE YOU GO, and ride safely. For information on road designations, conditions and closures, as well as registration (resident and nonresident), permits, maps and off-roading laws, visit Montana State Parks. TRIP TIP: Did you know? 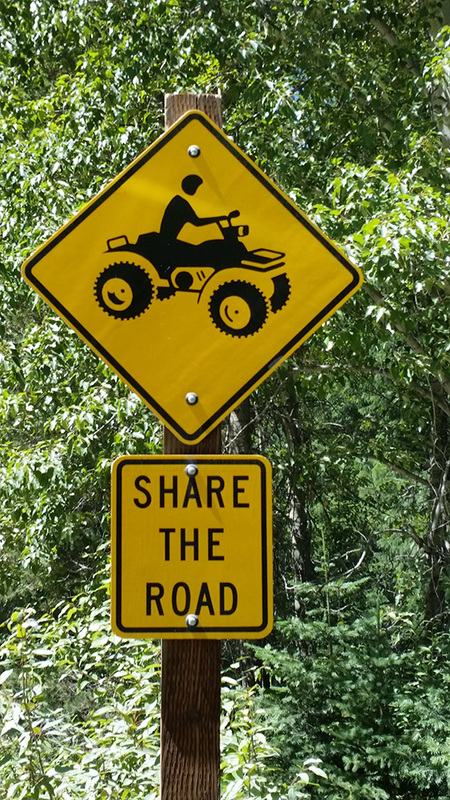 It’s legal to drive ATVs on roads and highways, as long as they’re equipped with “street kits.” This means that all public-land roads are open for riding! 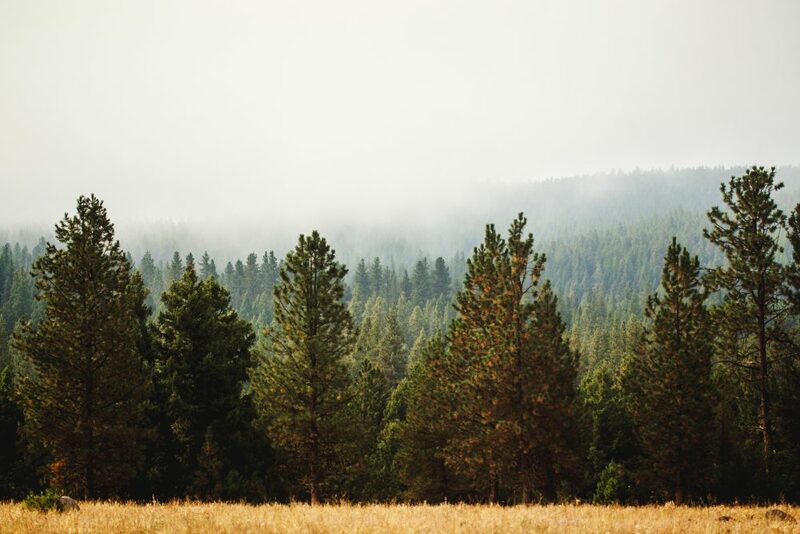 This entry was posted in Autumn, Bitterroot Valley, Columbia Falls, Darby, Eureka, Family Fun, Flathead Valley, Getting Around, Hungry Horse, Montana, Montana Fun, Outdoor Fun, Parks, Rexford, Things To Do, Uncategorized on September 4, 2018 by glaciermt. If you’ve been reading our blog, you know just how obsessed we are with Western Montana—the glacial-carved terrain, wildflower-filled meadows, charming small towns and endless outdoor adventure are all pretty easy to love. 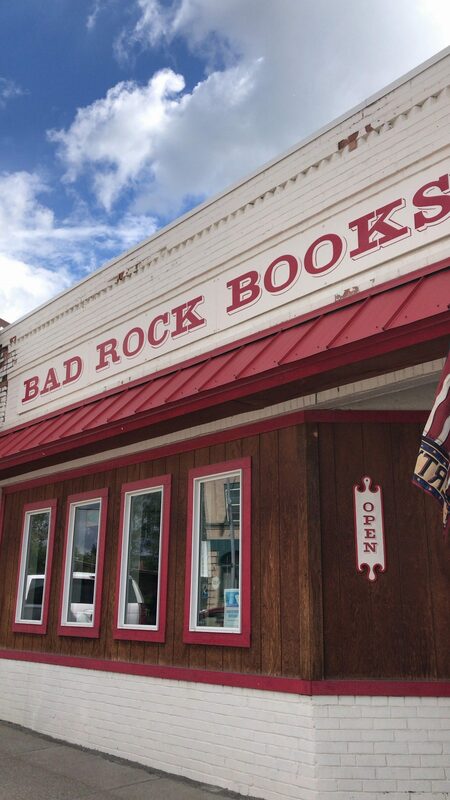 One of our favorite places to spend time in Glacier Country is Columbia Falls. A gateway to Glacier National Park, Columbia Falls is just 15 minutes from the park’s west entrance. This beautiful Montana town is home to locally owned shops, restaurants, a brewery and a not-to-be-missed summer farmers market. We recently explored this friendly little town, and it was such an enjoyable way to spend time in Western Montana’s Glacier Country. 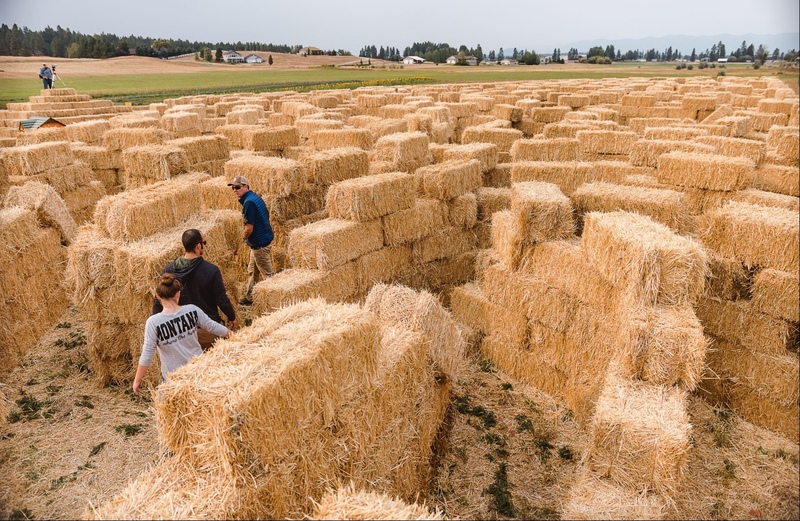 Check out our day below, and then head to Columbia Falls for your own adventure. 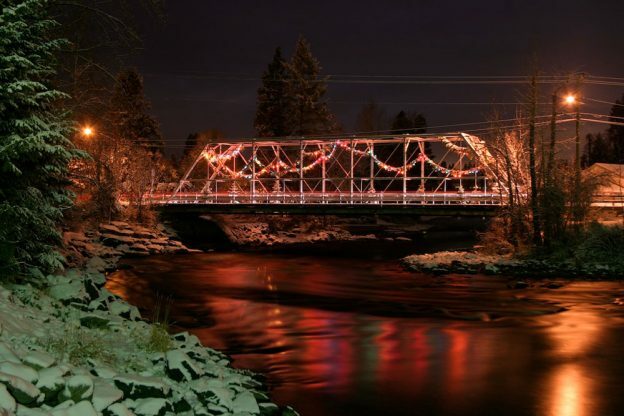 Old Red Bridge in Columbia Falls. Starting our morning off right, we headed to the Uptown Hearth. 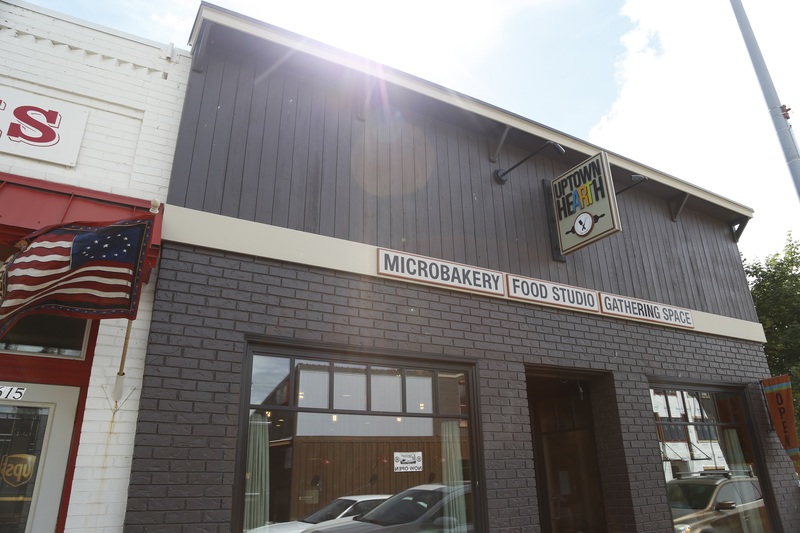 Walking into this microbakery and food studio feels like a big warm hug. It’s a super cozy spot with the scent of coffee and freshly baked pastries filling the air. Azul Coffee Bar shares the space with Uptown Hearth (hence the mouthwatering aroma) and offers handcrafted specialty coffee and espresso served from a custom-built mobile coffee cart. This is honestly some of the best coffee we’ve ever tasted. 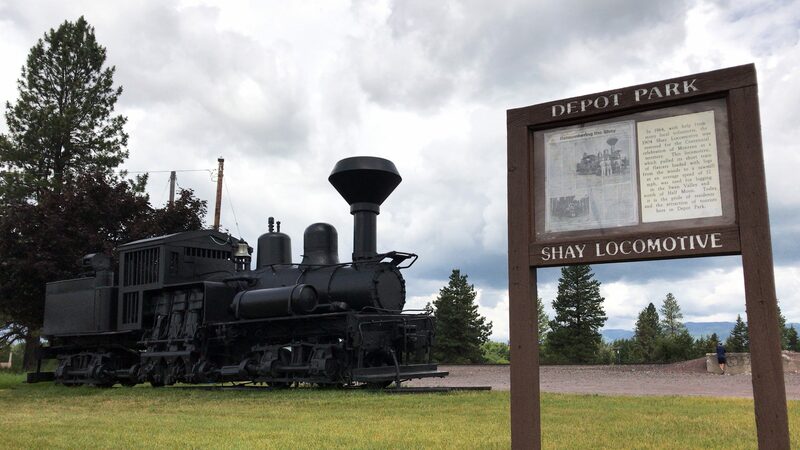 Just a short walk from Bad Rock at 57 Railroad Street and Nucleus Ave. we explored Depot Park’s historic locomotive, the Shay Engine. Pssst…this is a great outdoor spot for a family picnic. Montana has become a top destination for breweries and distilleries, and one of our favorite brew stops is Backslope Brewing. 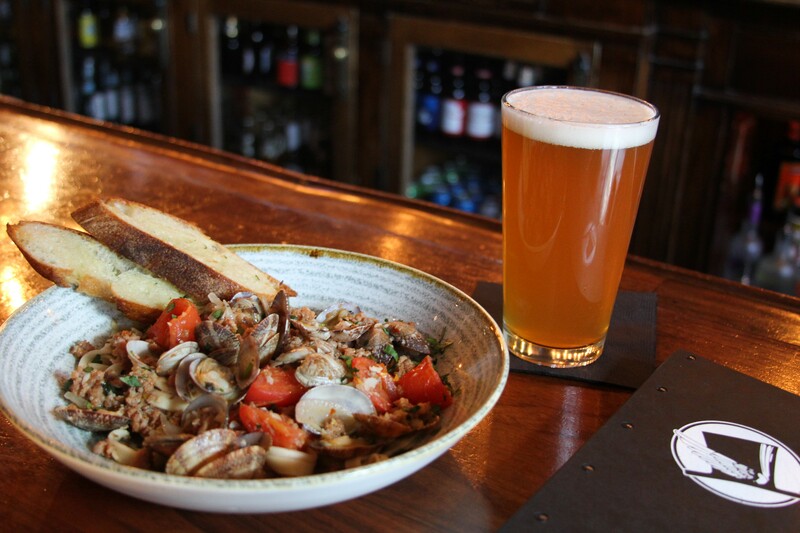 Located in the shadows of Glacier National Park, Backslope offers a comfortable atmosphere to indulge in a delicious, handcrafted beer, and we did just that. 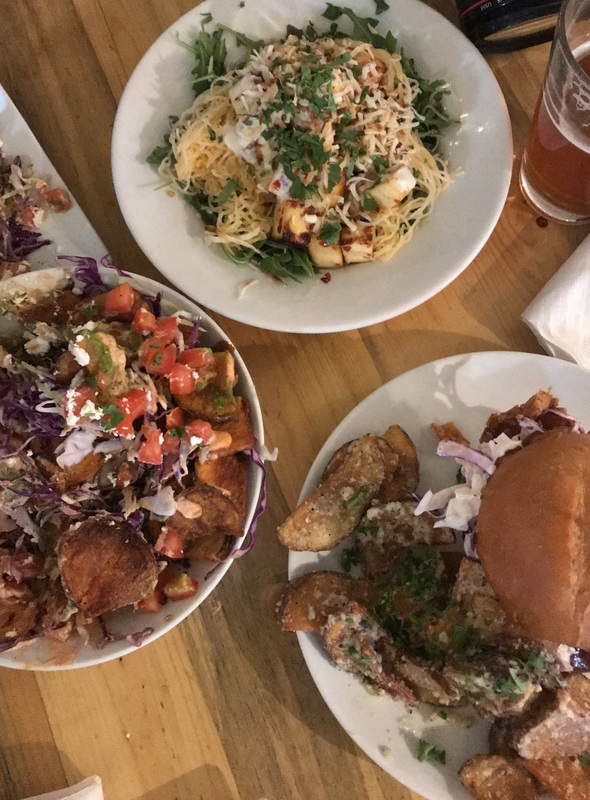 Not only is the beer at this brewery tasty, but they also offer an amazing selection of food. From burgers to parmesan fries and dessert, the array of delectable foods made it hard to choose! 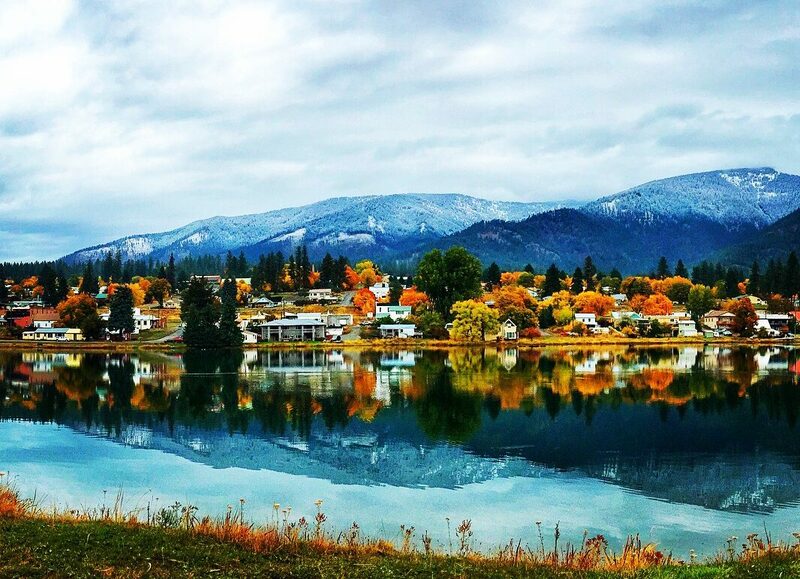 If you’re planning to visit Western Montana, Columbia Falls is just the place for a true taste of the charm, hospitality and fun Glacier Country offers. This entry was posted in Columbia Falls, Family Fun, Food, From The Road, Getting Around, Montana, Montana Fun, Outdoor Fun, Summer, Things To Do, Uncategorized on July 9, 2018 by GlacierMT. 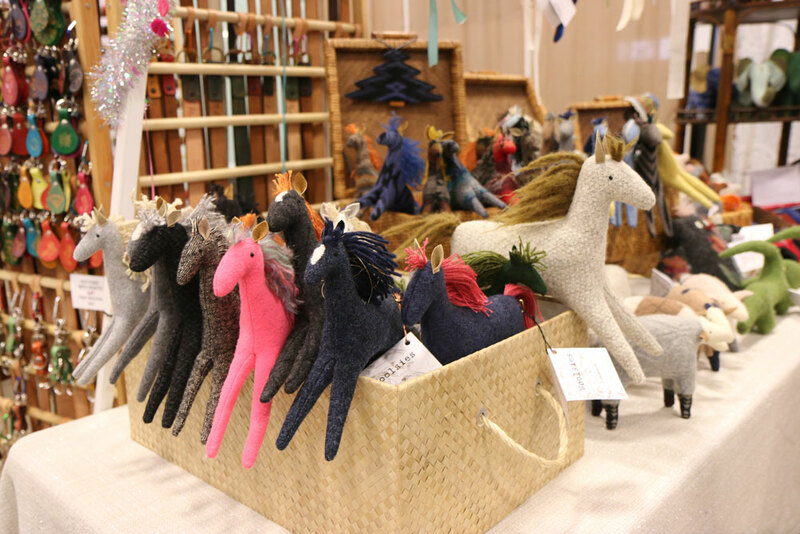 Homegrown, handmade and locally harvested—that’s what you’ll find in abundance across Western Montana’s Glacier Country. The farmers market scene here is brag-worthy. Locally grown produce is a given, but there’s so much more to discover, from fresh flowers and baked goods to cheeses, meats, honey, jams and jellies, coveted Montana huckleberries and Dixon Melons, plus the elusive morel mushrooms. 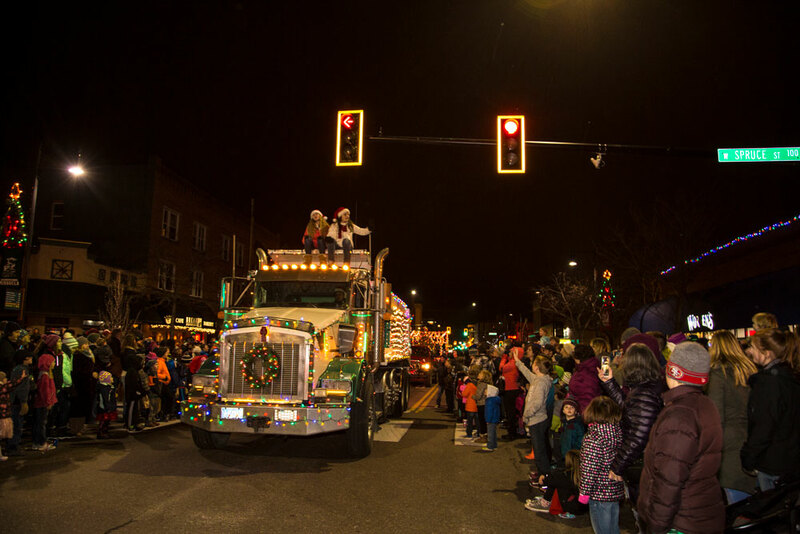 Experience a bright morning or early evening stroll through historic downtown streets or a community park for live music, coffee carts, food trucks, handmade arts and crafts, friendly locals and of course, a spirit you’ll only find in a charming small town in Western Montana. 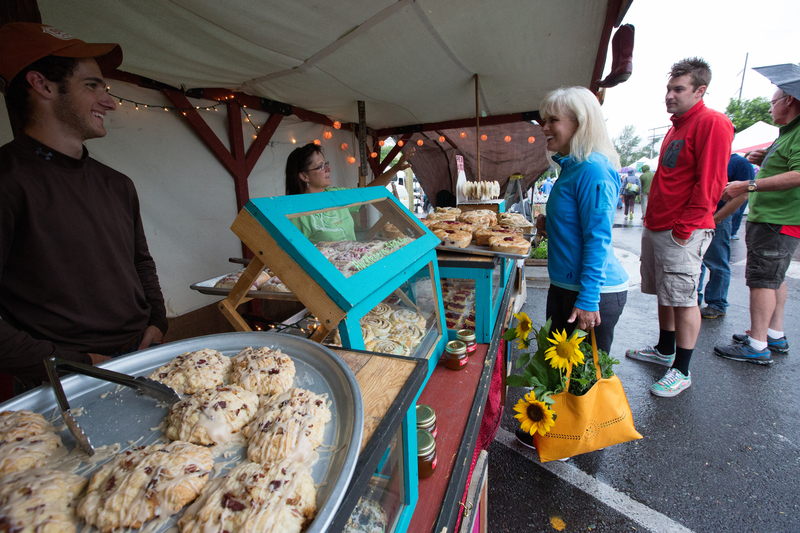 With 75+ communities brimming with local pride, it’s no surprise Glacier Country plays host to so many outdoor markets—more than 20, in fact—including the Missoula Farmers Market, voted Best in the West by Sunset magazine. Below you’ll find all of the markets in our area listed out. 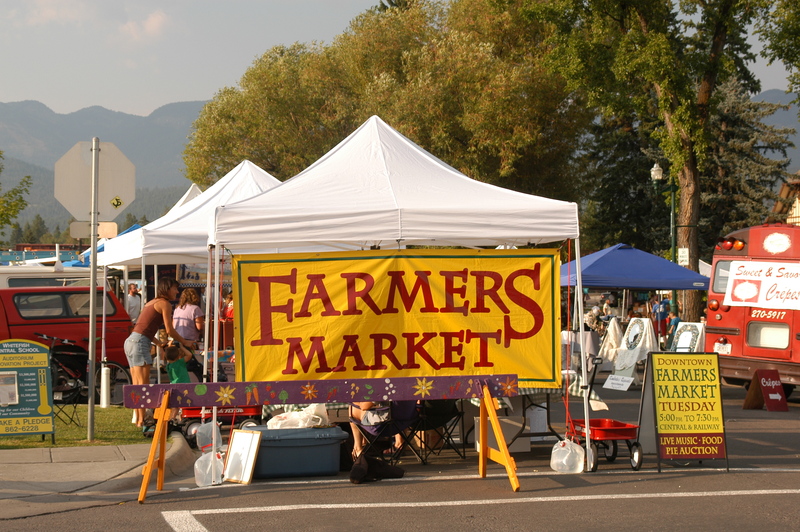 While you’re at it, check out the Montana Office of Agriculture’s Famers Market Directory for a complete list of markets around Glacier County and the rest of the state! 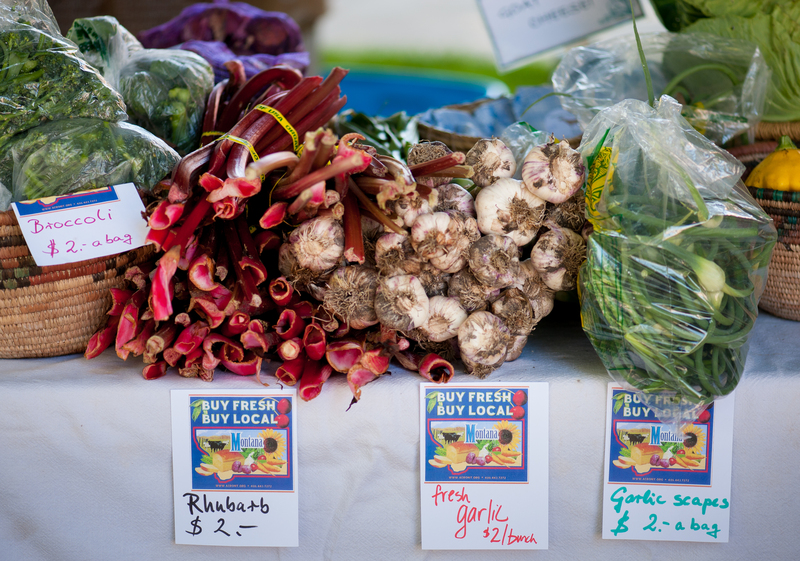 Go and enjoy all that our wonderful farmers markets have to offer. 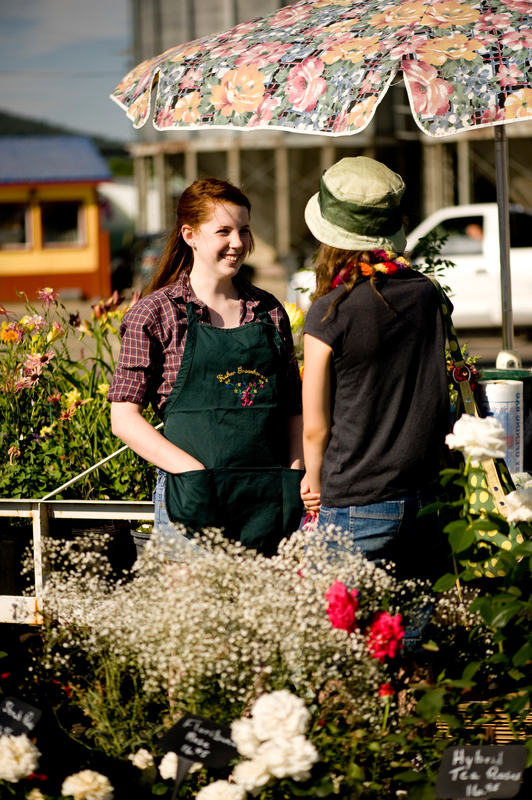 Note: markets are seasonal, and usually open May through September/October, but check specific dates before visiting. Wednesdays 4 p.m. – 7 p.m.
Thursdays 5 p.m. – 8 p.m.
Tuesdays 3 p.m. – 6 p.m. + Fridays 10 a.m. – 1 p.m.
Mondays 3 p.m. – 7 p.m.
Mondays 5 p.m. – 8 p.m.
Thursdays 5 p.m. – 7:30 p.m.
Wednesdays 3 p.m. – 6 p.m.
Tuesdays 10 a.m. – 2 p.m.
Wednesdays 3:30 p.m. – 6:30 p.m.
5189 State Highway 93 S.
Saturdays 9 a.m. – 12:30 p.m.
Thursdays 4 p.m. – 7 p.m.
Tuesdays 5:30 p.m. – 7 p.m. + Saturdays 8 a.m. – 12:30 p.m.
Circle Square, north end of Higgins Ave.
Saturdays 8 a.m. – 1 p.m.
Local bakery treats and food trucks complete the Western Montana Farmers Market experience. Sunday’s 10 a.m. – 6 p.m.
Fridays 9 a.m. – 2 p.m.
Fridays 9 a.m. – 1 p.m.
Thursdays 4 p.m. – 6 p.m.
Sundays 10 a.m. – 1 p.m.
Saturdays 10 a.m. – 2 p.m.
Saturdays 9 a.m. – 12 p.m.
Fridays 3:30 p.m. – 6:30 p.m.
Fridays 3 p.m. – 6 p.m.
Tuesdays 5 p.m. – 7:30 p.m.
At the North end of Central Ave. This entry was posted in Alberton, Arlee, Arts and Culture, Bigfork, Bitterroot Valley, Columbia Falls, Cut Bank, Darby, Eureka, Events, Family Fun, Farmers Market, Flathead Valley, Florence, Hamilton, Kalispell, Libby, Missoula, Montana, Montana Fun, Outdoor Fun, Paradise, Plains, Ronan, Seeley Lake, Seeley-Swan Valley, Stevensville, Summer, Superior, Things To Do, Tour 200, Troy, Uncategorized, West Glacier, Whitefish on July 2, 2018 by glaciermt. 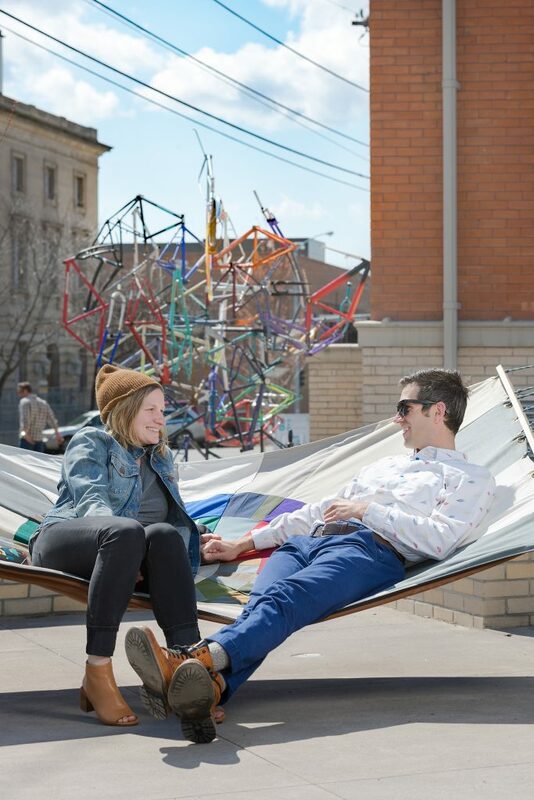 In Glacier Country, springtime means swing time. As the snow melts and the greens emerge, we dust off our golf clubs and get ready to play a round (the first of many). From public to semi-private courses, there’s no better place to tee up when you’re looking for a scenic swing, a championship course, and affordability. Golfing is one of those activities that really allows you to take in your surroundings, and here in Western Montana, the vistas are stunning, and you’re bound to catch a glimpse of some wildlife on the sidelines. 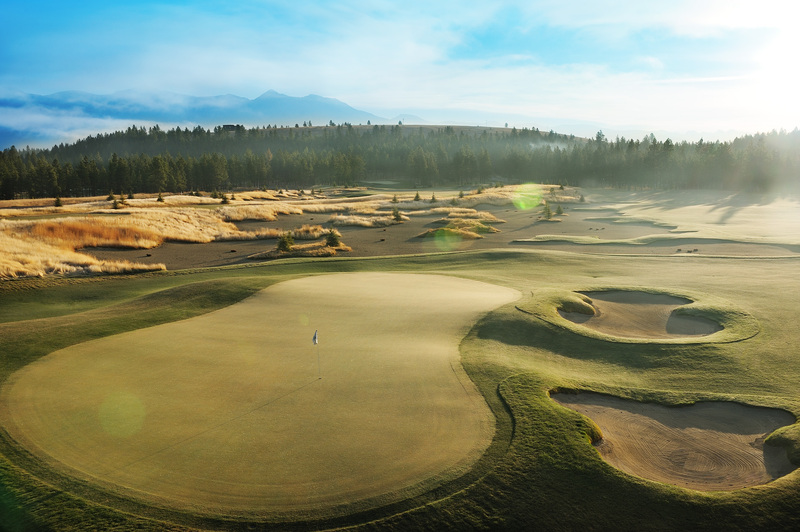 The Flathead Valley alone boasts 10 championship golf courses, all within a 45-minute drive of each other. 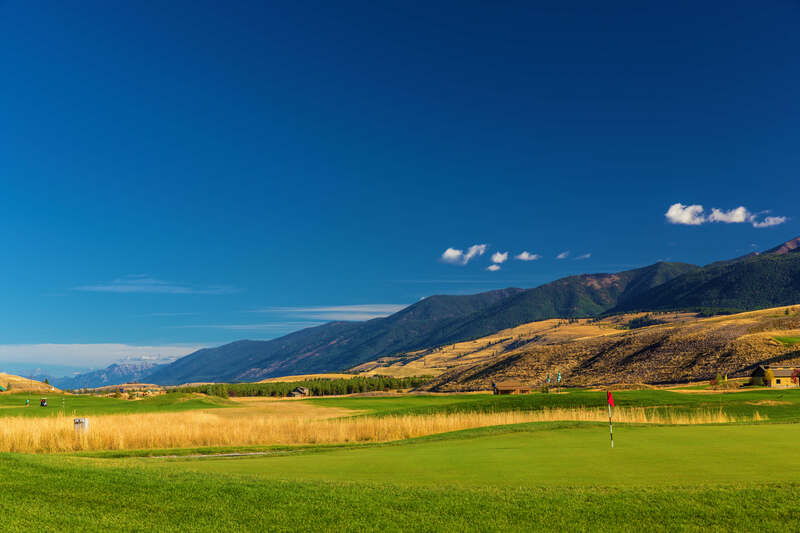 This golfer’s haven—and exceptionally beautiful part of Montana—has been named one of “the world’s top 50 golf course destinations” by Golf Digest. 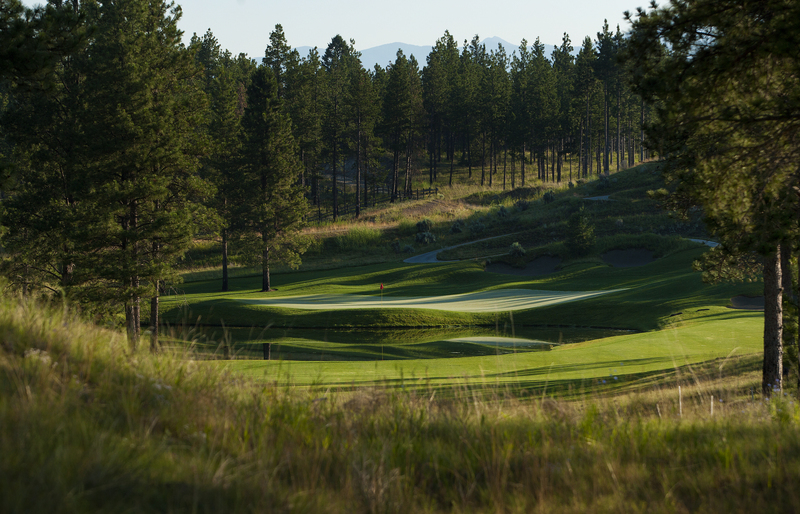 Our award-winning courses range from leisurely to challenging, so whether you’re serious about your swing or just out to have fun, there’s a course for you in Western Montana’s Glacier Country, and stay-and-play golf packages are always available. Here are six of our favorite places to sink one. It’s tee time in the Tobacco Valley at the unique, master-planned recreational community of Indian Springs Ranch. This laid-back links-style public course sits at the foot of the western edge of the Rocky Mountains and offers a challenging experience for all skill levels. The course is designed to blend seamlessly with its natural surroundings, allowing players to immerse themselves in the beauty of the landscape and have a fun, relaxing game. Mere minutes from Glacier National Park—think epic views of stunning peaks and sparkling lakes—this full-service resort and spa boasts an 18-hole, 4.5-star-rated championship golf course. This authentic “mountain golfing” experience offers the Flathead Valley’s most challenging layout. 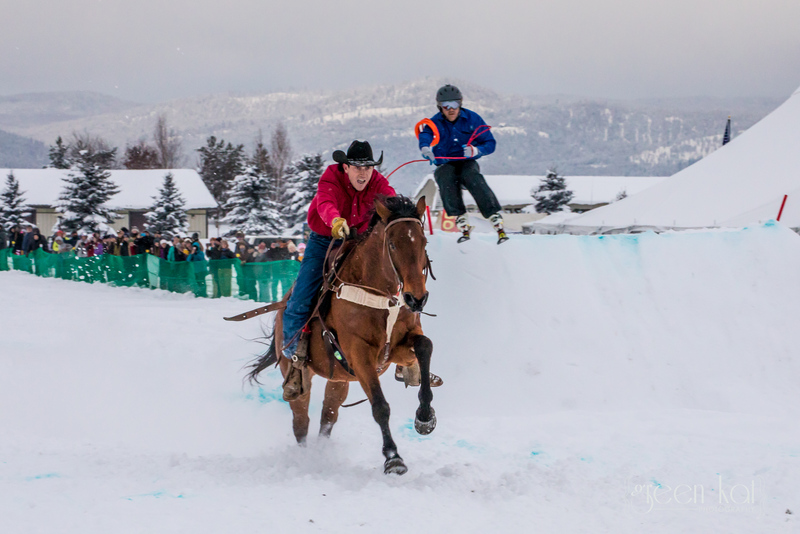 Come test your skills and soak up some of Western Montana’s finest hospitality. This Schmidt Curley-designed course was rated No. 9 in the U.S. in 2007 by Golf Digest and No. 1 in Montana in 2008 by Golfweek. 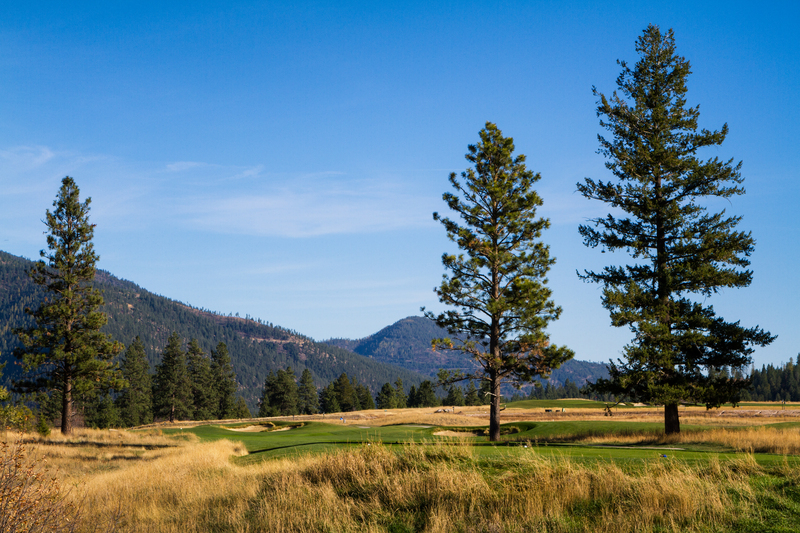 Canyon River Golf Club’s course meanders through towering pines and lush, native grasslands. Seven holes incorporate the riparian marshland and pristine mountain lakes on the property. Missoula is also a very explore-worthy small town with a lot of personality to boot. Tree-lined fairways meet awe-inspiring lake views at the only 36-hole golf facility in the region, featuring all the amenities of a world-class resort course, all situated in one of Montana’s hippest towns—Whitefish. Beginners and experienced players alike will find plenty of choices and challenges on the beautiful, treed North and South courses. Tee-Tip: The greens are fast on this one! This true golfer’s paradise in the heart of the Rockies among towering ponderosa pine trees offers breathtaking views of the Swan and Mission mountains and a premier Montana golf resort getaway experience. The Double Arrow provides a full golf vacation package. Tee-Tip: the 15th hole on this championship course is their signature hole, with an elevated tee and island green. Double Arrow is a must-stay place, complete it with some tee time. Designed by golf legend Nick Faldo, the Wilderness Club was ranked the No. 1 golf course in Montana by Golfweek and Golf Magazine and the No. 2 Best New Private Golf Course in the USA by Golf Magazine. For a visually stunning and world-premier luxury golf experience, with all the comforts you’d expect, Wilderness Club delivers, whether you’re a low handicapper or a total beginner. This entry was posted in Columbia Falls, Eureka, Family Fun, Guest Ranch, Missoula, Montana, Montana Fun, Outdoor Fun, Seeley Lake, Stay, Summer, Things To Do, Uncategorized, vacation, Whitefish on May 9, 2018 by glaciermt. This probably comes as no surprise, but we’re suckers for romance. That’s because we’re surrounded by natural beauty and breathtaking places go hand in hand with romantic adventures. 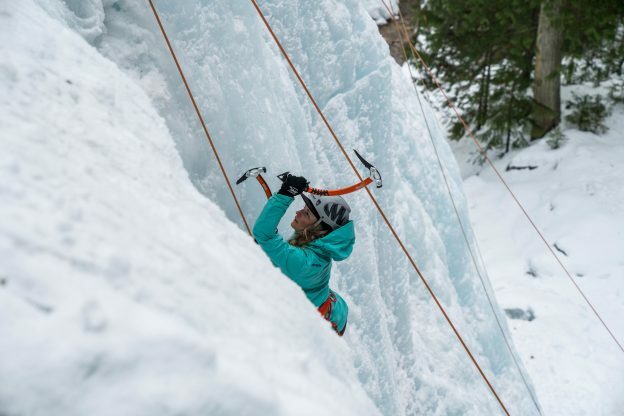 It’s simple to see why Glacier Country is the perfect spot for new couples to connect and longtime lovebirds to rekindle the romance. 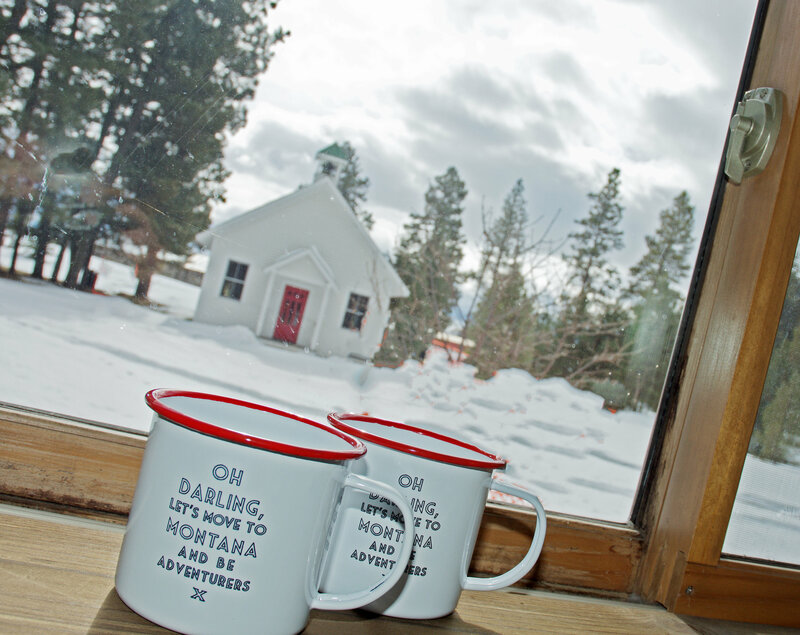 Winter or summer, Western Montana is the perfect setting for a romantic getaway. 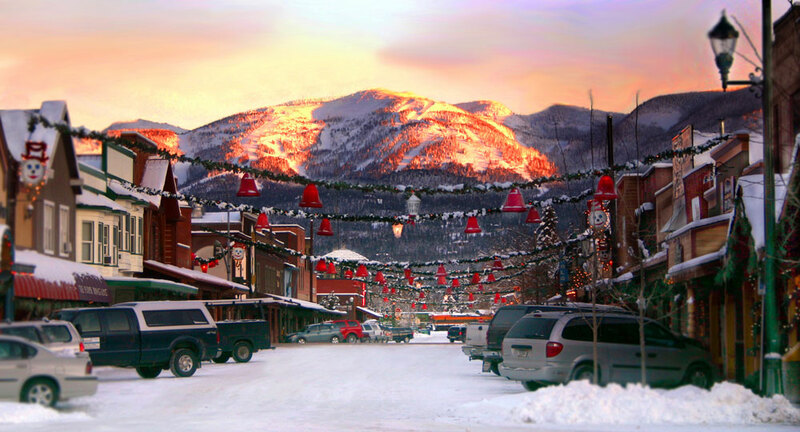 Whether you’re looking for a rustic weekend adventure in the woods, a relaxing spa retreat in a mountain lodge, a quiet bed-and-breakfast with personalized service or a luxury hotel in one of our bustling (and quite charming) community downtowns, Western Montana is always ready to make your time together memorable. Surprise your partner this Valentine’s Day (pssst…it’s just around the corner) and plan a late-winter weekend or spring fling in Glacier Country. 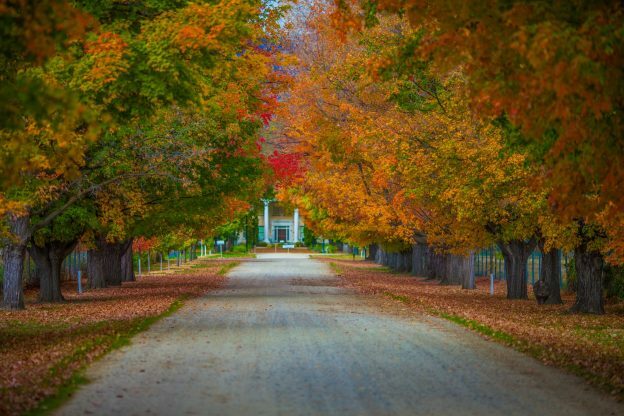 Here’s your romantic getaway trip planner for some ideas. A tad southwest of Seeley Lake, The Resort at Paws Up in Greenough offers luxury lodging, spa packages for couples and 37,000 gorgeous acres with inclusive year-round activities like ice skating, snowshoeing and nature hikes. 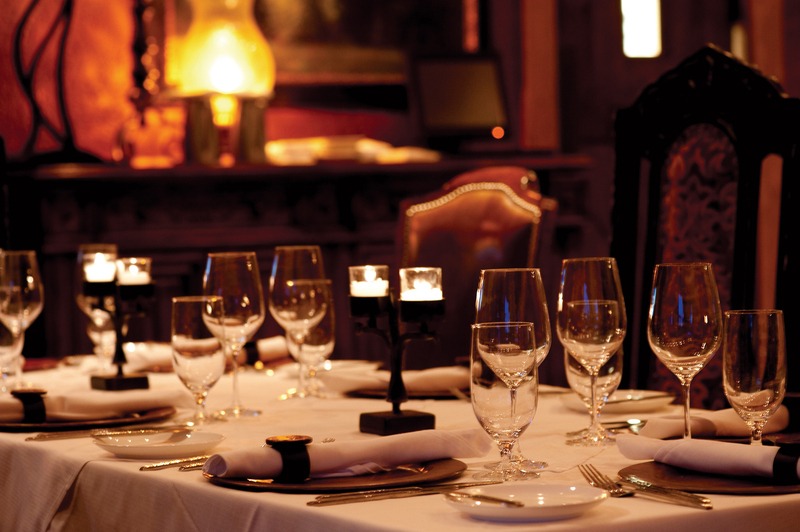 The Resort at Paws Up knows fine dining, so treat you and your special someone to a world-class dinner. Head north for a relaxing escape to the woods at Silverwolf Log Chalets—private designer chalets built for two, just minutes from the western entrance of Glacier National Park. 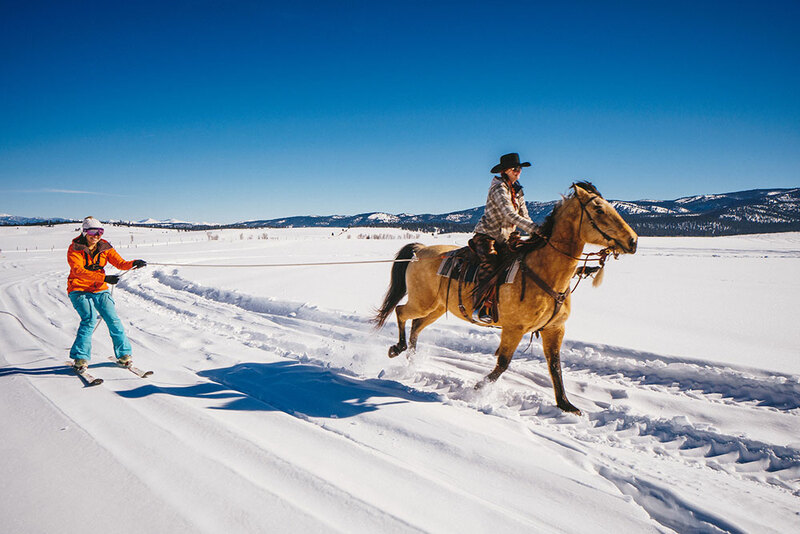 Nearby Coram’s Green Valley Ranch offers fantastic Montana accommodations, breathtaking views of the park and snowmobiling adventures with Swan Mountain Snowmobiling. Indulge in one-hour massages for two as part of the spa package at Whitefish’s Kandahar Lodge. This authentic mountain lodge offers cozy accommodations and upscale dining—or check out the Tupelo Grille, one of the top eateries in the Flathead Valley. 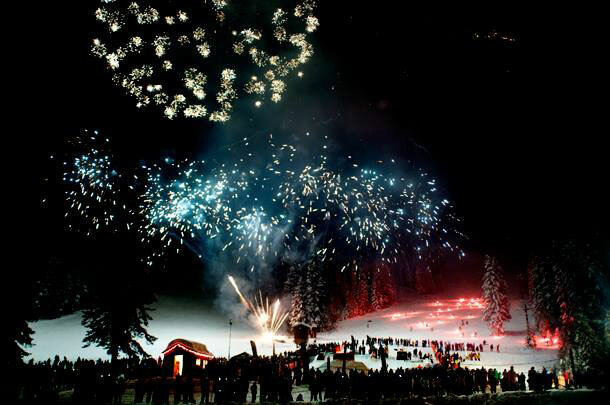 Taste the local spirit and toast to your time together at Spotted Bear Spirits or Great Northern Brewing Co.
Bigfork lays on the charm with fireside steaks and lake views at Terra Steak at Mountain Lake Lodge. The lodge also offers fireplace suites, on-site massages and winter packages. 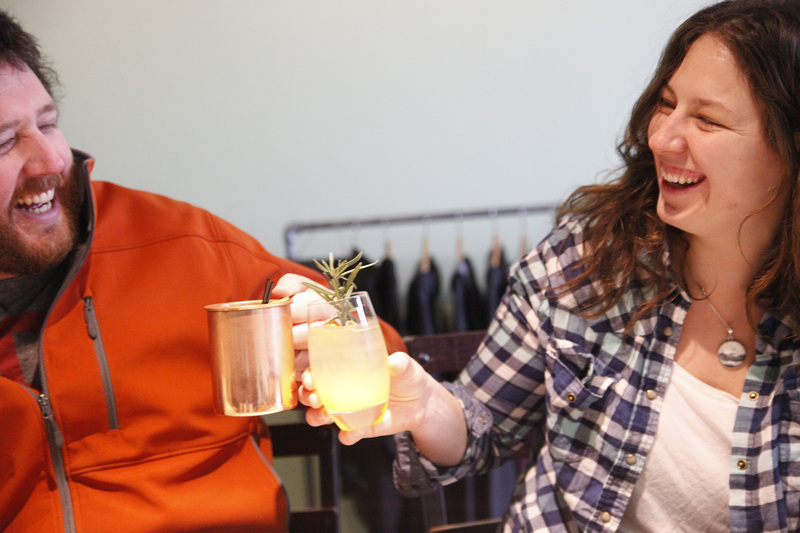 While you’re in town, find time to enjoy Pink Peppercorn Pear Gin cocktails at Whistling Andy Distillery. 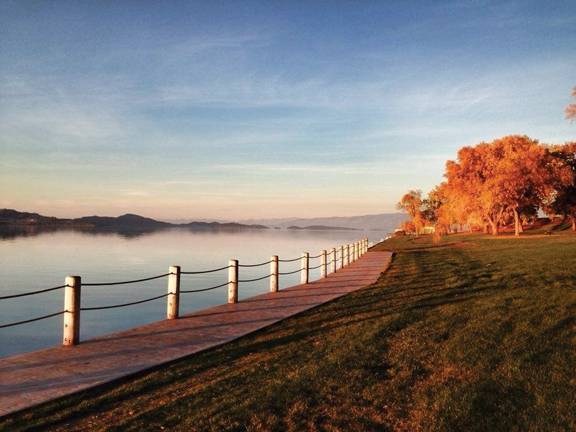 Further south on Flathead Lake, Red Lion Ridgewater Inn & Suites is the perfect home base for exploring Polson. 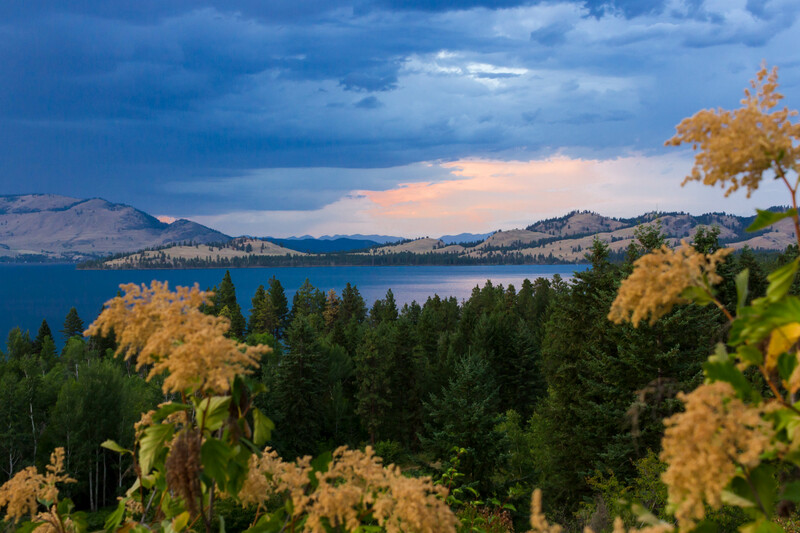 Flathead Lake stuns year-round, and Polson offers easy access to surrounding recreation areas. West of the lake, soak in the healing mineral waters at the local hot springs resort in Hot Springs. Head north and stay in a Jacuzzi suite or cabin on the shores of Noxon Reservoir at Trout Creek’s Lakeside Motel & Resort. 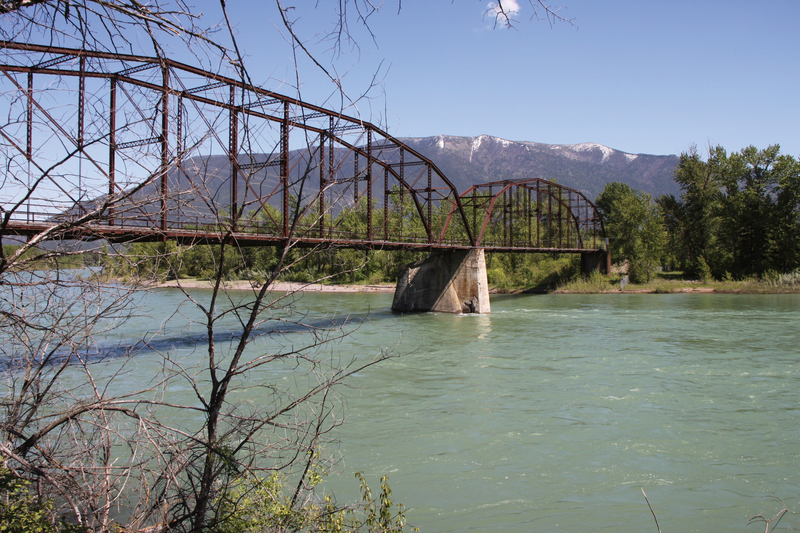 Find Western Montana’s cultural hotspot in Missoula. 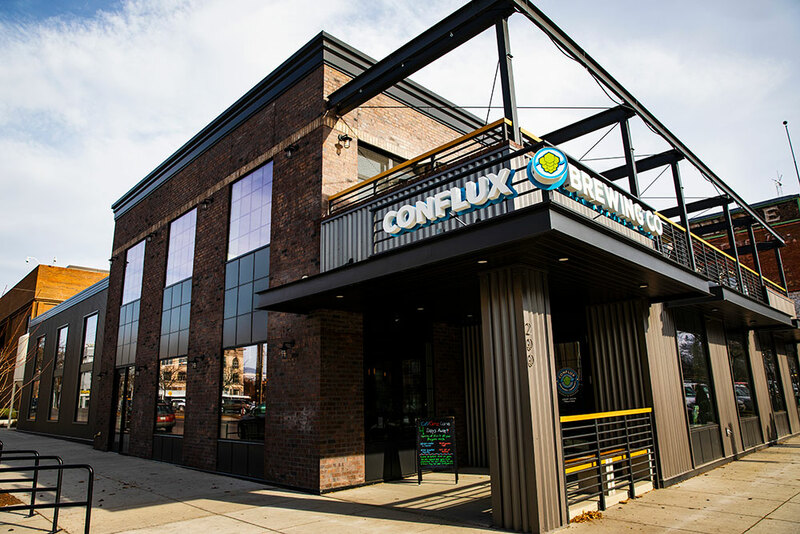 This lively town is explore-worthy all year long, boasting galleries, museums, theaters, eclectic dining spots, breweries, distilleries and wine bars. 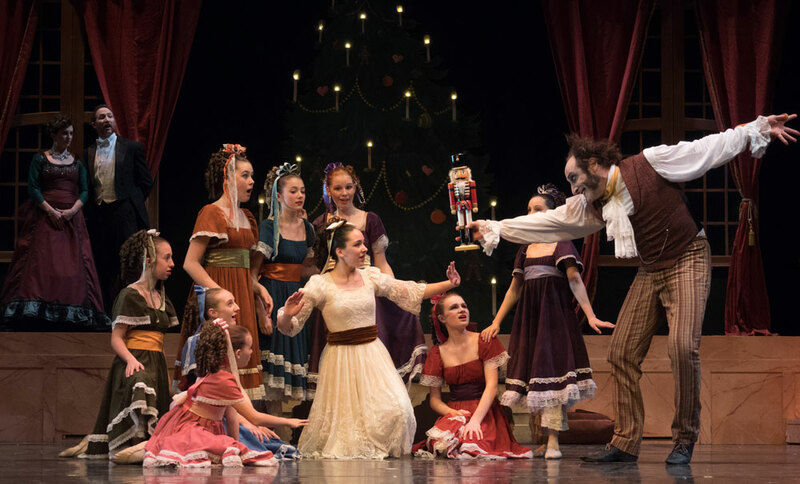 Stay at the 1903 Gibson Mansion B&B—where Victorian elegance meets modern convenience—and plan your trip around a show at The Wilma, Missoula Community Theatre or The Top Hat. The Top Hat has amazing food to boot. By day, explore Missoula’s shops, galleries, cafés and coffee shops. Not to be missed: the free Missoula Art Museum. The Bitterroot Valley beckons those looking for a relaxing getaway. Immerse yourself in cowboy culture at Darby’s award-winning, adults-only retreat, Triple Creek Ranch. 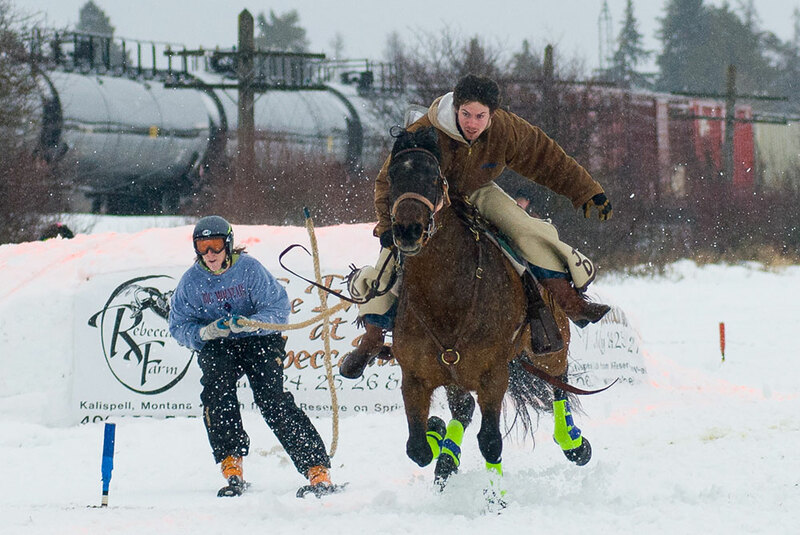 Embark on a dog-sledding adventure, ride horses and enjoy fine wines. 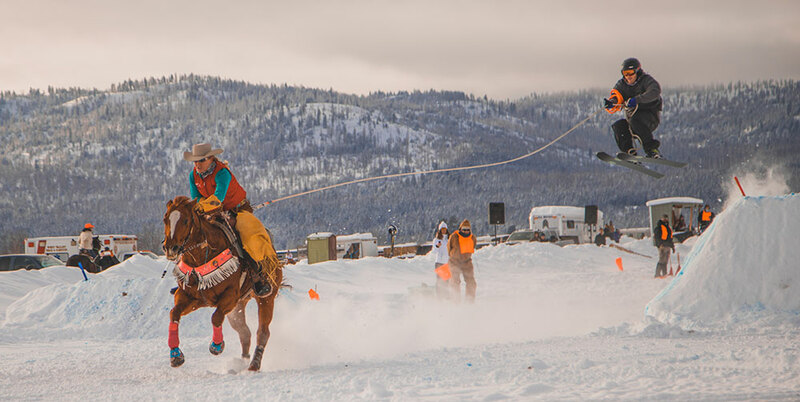 Also in Darby, take a guided snowmobile ride with Rye Creek Ranch or experience true western hospitality at the Bitterroot River Ranch. Just north in Hamilton, ABC acres offers a unique permaculture farm-stay for eco-minded couples looking to experience ecological design and sustainable food, production and healthy living systems. The Ranch at Rock Creek in Philipsburg is the world’s only Forbes Travel Guide Five-Star Guest Ranch. Need we say more? Find downhill skiing nearby or cross-country ski at Georgetown Lake. Stop for treats at The Sweet Palace, or treat your sweetheart to a beautiful piece of Montana jewelry at The Sapphire Gallery and when the weather gets warmer, pan for your own sapphires. Want to take your relationship to a new level? Book a scenic flight over the jaw-dropping Mission Valley with Blue Goose Aviation (by appointment only and weather dependent). Just outside Glacier National Park, bring your creative spirits to experience the stillness, splendor and simplicity at Columbia Fall’s unique Dancing Spirit Ranch where you’ll have the opportunity to become one with nature (or two, as it were). 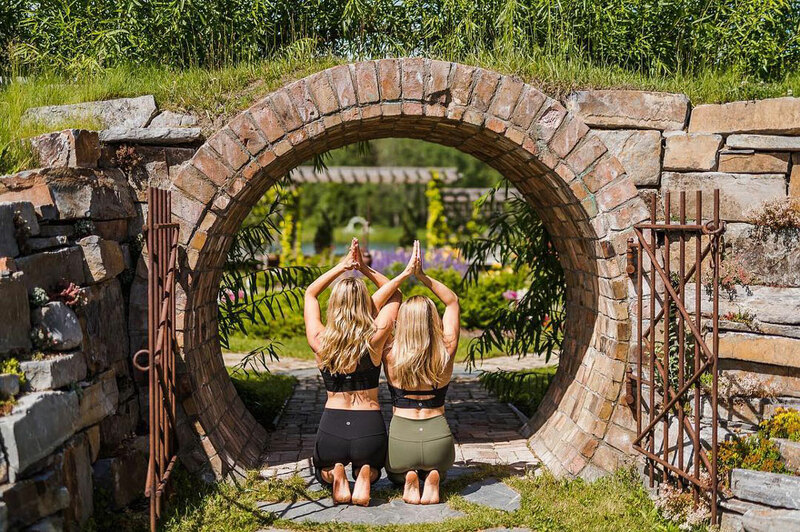 With winter yoga retreats and activities like Thai bodywork for couples, you’re sure to connect with yourself and with each other. Nearby in Kalispell, enjoy a concert by the Glacier Symphony and Chorale. 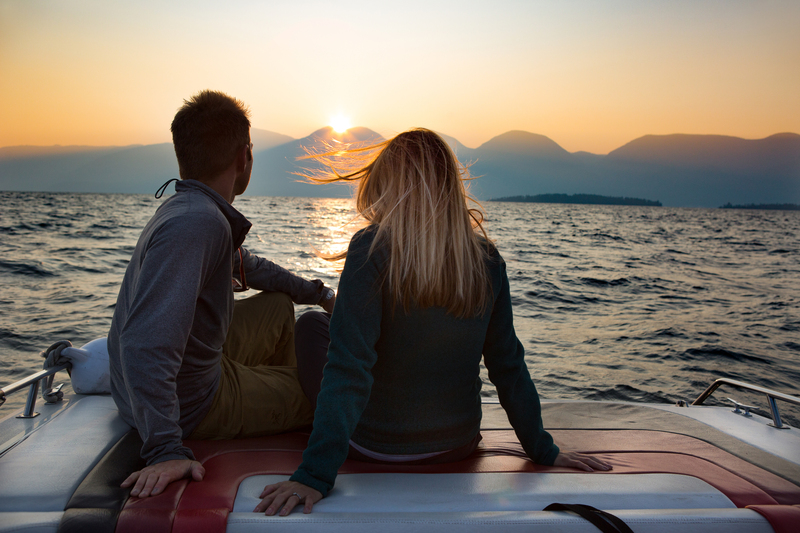 There’s no end to the romantic adventures and authentic experiences couples can experience in Western Montana’s Glacier Country. Make time to connect under the big sky. This entry was posted in Art, Arts and Culture, Bigfork, Columbia Falls, Coram, Darby, Events, Family Fun, Food, Getting Around, Glacier National Park, Greenough, Guest Ranch, Hamilton, Holidays, Missoula, Montana, Montana Fun, Noxon, Outdoor Fun, Polson, Seeley Lake, Shopping, Stay, Swan Lake, Things To Do, Uncategorized, vacation, Whitefish, Winter Fun on February 12, 2018 by glaciermt.